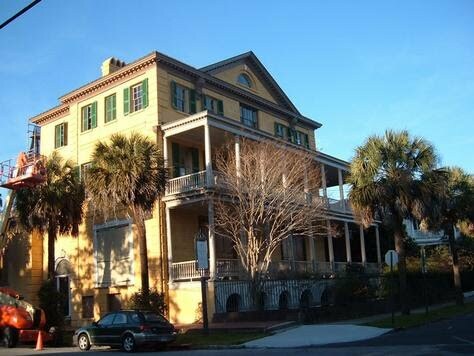 Completed in 1811, the William Aiken House is named after its first occupant, a successful Charleston merchant and president of the company that built South Carolina's first railroad. The house is one of the best designed and crafted houses in the city and part of a national historic landmark district, along with its gardens, wrought-iron gates, and outbuildings that include a Gothic revival-style carriage house. The house was used for offices from 1877-2000, when it was converted into an event venue with offices and retail space. The rehabilitation restored the house's original craftsmanship and design with help from an NPS Federal Historic Preservation Tax Credit. Missing historic features in the first floor parlors were restored, and existing historic materials and finishes throughout the property were carefully conserved. The property's exceptional historic design can once again be fully appreciated by the community. The William Aiken House is nestled in the heart of Charleston's Upper King Design District. A close-knit mix of architects, interior designers, artisans, independent clothing, jewelry, furniture and bookshops create a vibrant streetscape with an exciting energy. The venue is also within walking distance to area hotels and shopping and just 20 minutes to the Charleston International Airport and area beaches. Parking is available on the street and in nearby garages and lots.